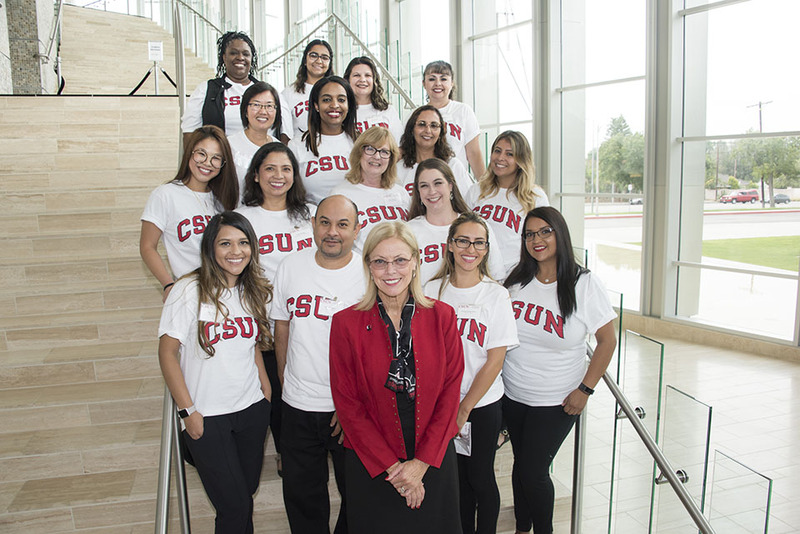 CSUN President Dianne F. Harrison highlighted the numerous accomplishments of the university’s faculty, students and staff in her annual Welcome Address to the university Aug. 24, at the Younes and Soraya Nazarian Center for the Performing Arts. Photo by Lee Choo. 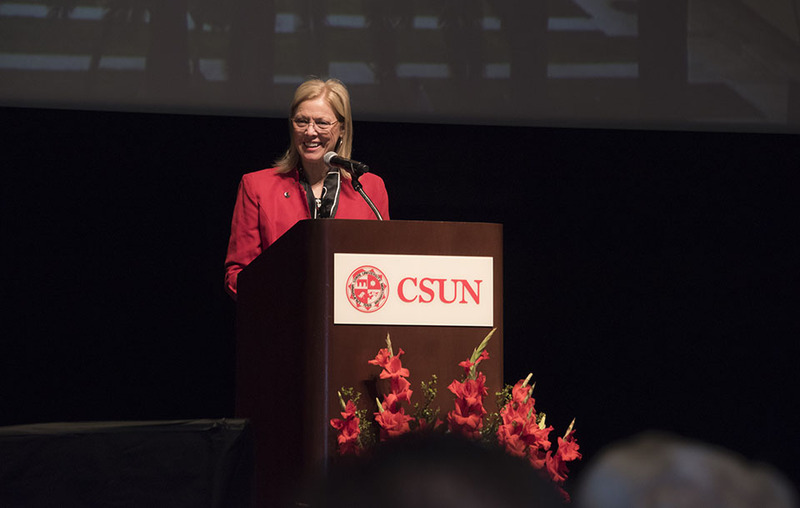 CSUN President Dianne F. Harrison highlighted the numerous accomplishments of the university’s faculty, students and staff in her annual Welcome Address to the university Aug. 24, at the Younes and Soraya Nazarian Center for the Performing Arts. Photo by David J. Hawkins. Faculty President Adam Swenson introduces CSUN President Dianne F. Harrison, who highlighted the numerous accomplishments of the university’s faculty, students and staff in her annual Welcome Address to the university Aug. 24, at the Younes and Soraya Nazarian Center for the Performing Arts. Photo by David J. Hawkins. 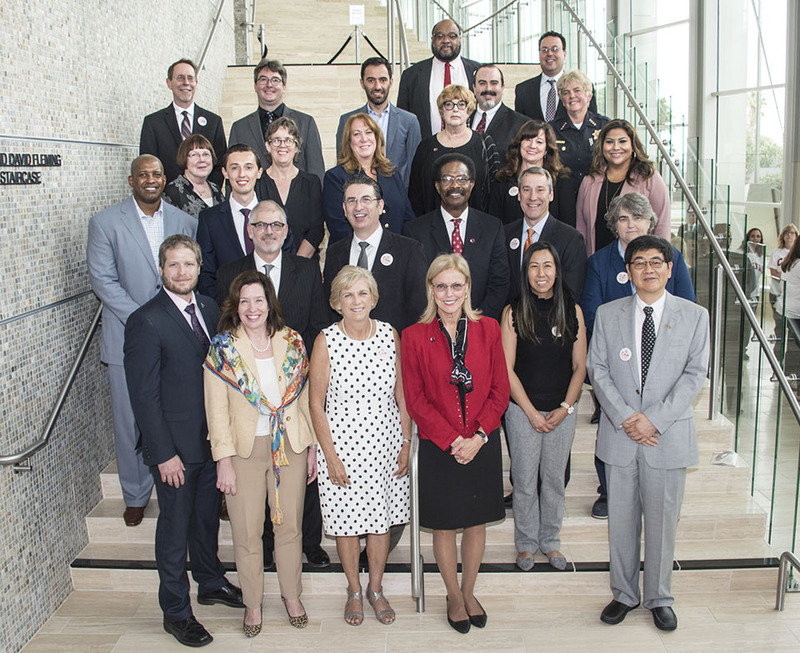 CSUN President Dianne F. Harrison with her Extended Cabinet, Aug. 24 at the Younes and Soraya Nazarian Center for the Performing Arts. Photo by Lee Choo. California State University, Northridge President Dianne F. Harrison highlighted the numerous accomplishments of the university’s faculty, students and staff in her annual Welcome Address to the university Aug. 24, and presented the opportunities and challenges of the new academic year that began Aug. 26. 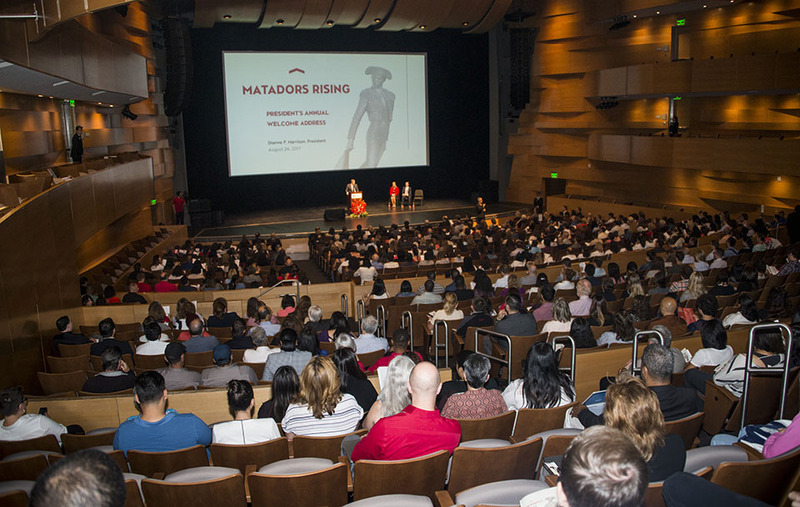 With nearly 40,000 students anticipated this fall, Harrison affirmed that all employees play a role in “Matadors Rising” — the title of Harrison’s speech and the name of CSUN’s student success campaign to help more students earn degrees and realize their potential. 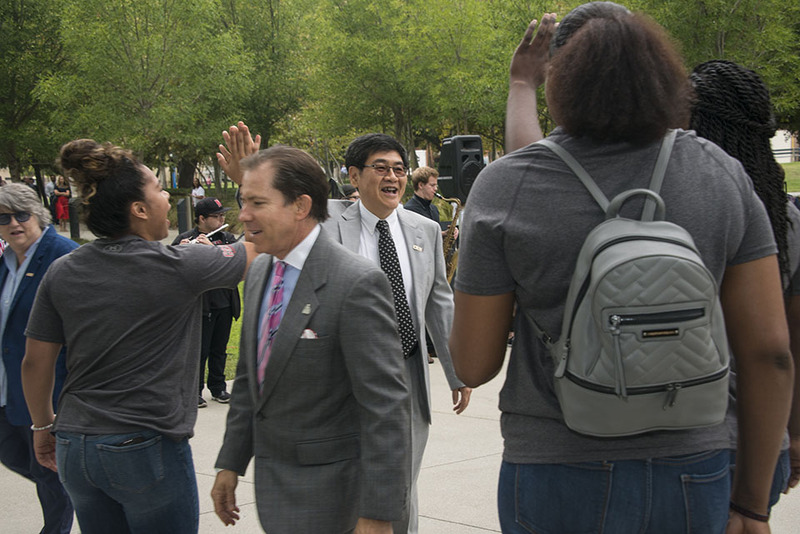 “With student success as the university’s number one priority — ‘Matadors Rising’ is an effort to which everyone on campus, regardless of our role, department or division — can and does contribute,” she said. Spotlighting the accolades and milestones that occurred during the past academic year, Harrison linked these initiatives and programs to student success. The speech outlined the university’s planning priorities — from student success to using athletics as a tool for student, community and regional engagement — with particular focus throughout on student success and boosting graduation rates. In two of many campus highlights and examples of academic success, Harrison praised CSUN students who have developed applications to improve accessibility and quality of life for people with disabilities, as part of technology and entrepreneurship competitions: In the university’s second annual Fast Pitch competition, CSUN undergraduates Edgar Limon, Arvin Flores and Jasmine Beeman developed “smart script” internet code to help visually impaired people better navigate through websites. And in the Information Technology-sponsored VARJAM event, student Miranda Taylor took first place for her “Adventure VR” virtual reality program that helps those with mobility challenges experience nature by bringing it to them. CSUN’s record-breaking 2017 graduating class of 11,500 will be followed by 10,000 new students this fall. 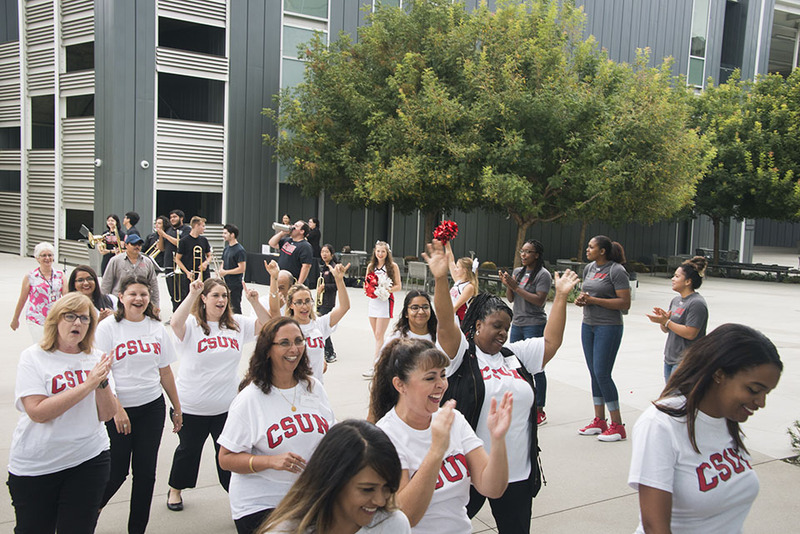 Harrison emphasized a number of innovative campus initiatives that focus on using data to improve CSUN graduation rates and student success, as part of the graduation goals for the year 2025 set forth by the CSU chancellor’s office and the CSU board of trustees. 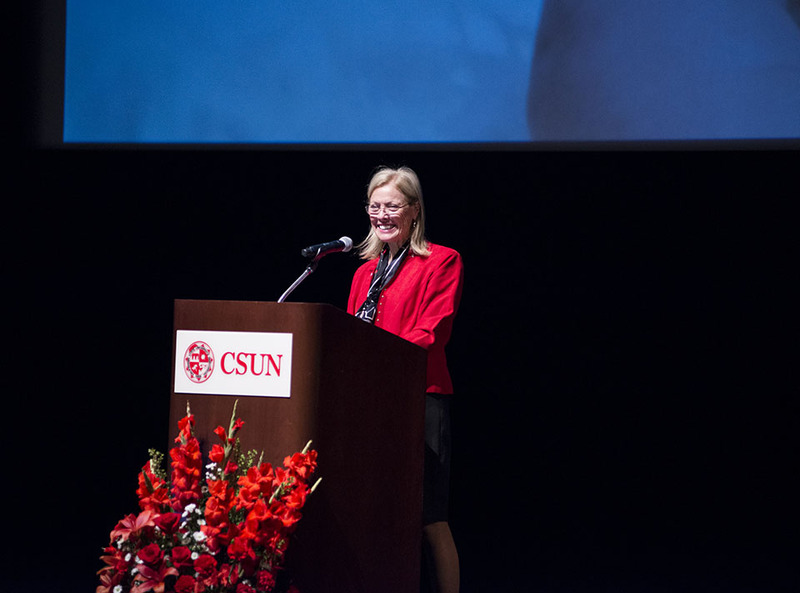 During her remarks, Harrison also struck a more somber note, reflecting the divided and unsettled mood in the country following this month’s violence in Charlottesville, Va.
Toward the conclusion of her address, Harrison drew the greatest applause from the assembled faculty and staff by speaking about CSUN’s commitment to its values, regardless of the changing political landscape. “I will not back down from facing white extremists and naming names: neo-Nazis, the KKK and a White House administration that seems so far not to be aligned with the values and goals that we hold at CSUN and the CSU (California State University),” she said. Philosophy professor Adam Swenson, president of the Faculty Senate, opened the program by welcoming new faculty members, staff and leadership. 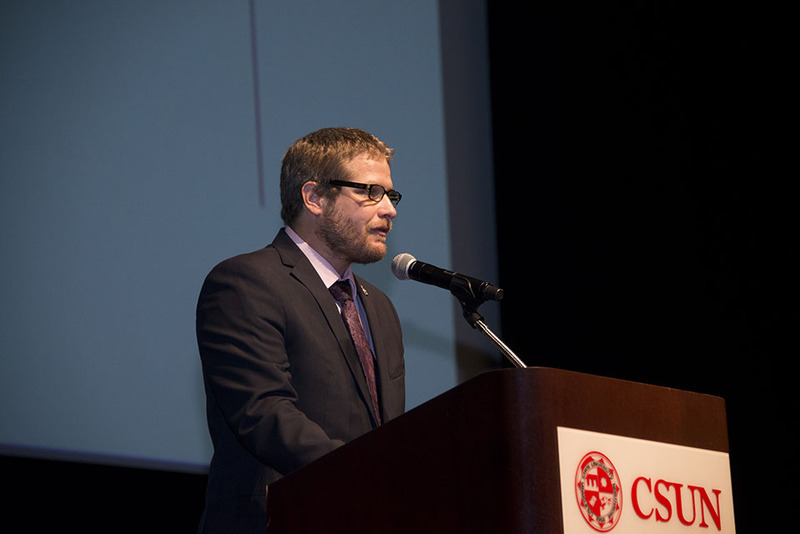 Jonathan Goldenberg, president of Associated Students, also gave greetings on behalf of CSUN’s students. Click here for the full text or to watch a video of President Harrison’s address.